Edenly stones are cut with the utmost precision to reveal their brilliance and beauty to the fullest. Edenly offers certified natural diamonds that meet the highest quality standards. They are consistent with the Kimberley Process, which ensures that the diamonds come from legal sources and are therefore not from war.The color of a diamond is measured using the international color scale which classifies them from D (colorless) to Z (yellow hue). 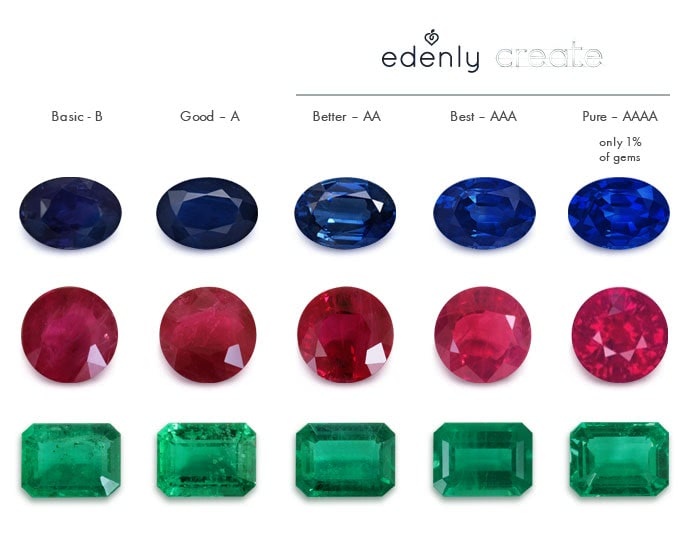 At Edenly, you will only find colorless or almost colorless diamonds (from D to H) whose possible inclusions are not visible to the naked eye (SI).Edenly provides with each of its jewels a certificate indicating the weight and the quality of the diamond. For tailor-made creations, with a diamond greater than 0.50 carat, a certificate from the Institute IGI (International Gemological Institute) will be automatically provided. Our colored stones respect the best quality standards. Also known as "exceptional quality". This quality refers to the beauty and intensity of the color as well as the transparency and quality of the stone size: "Very Good" at Edenly. Any inclusions, present mainly in large gems, are quite normal and natural. All our stones are natural. As a result, their color and intensity may vary from stone to stone; this is what makes them unique and precious. The color represented on our creation tool has been calibrated to match the real as closely as possible, but, considering the unique nature of each stone, this color on the screen cannot be contractual. Ruby and sapphire belong to the same family since they are formed under the same geological conditions. The difference lies in their chemical composition since rubies are heavily loaded with chromium which gives them their red color. Unlike sapphires, rough ruby crystals are less bulky so rubies of more than 2 carats are very rare and therefore quite expensive. The most recognized ruby deposits in jewelry and fine jewelery are in Asia, Burma, and East Africa. Depending on their origin, rubies will have variations of color and inclusions depending on the nature of the rock in which they were formed and the conditions of their crystallization. Rubies have a wide range of colors ranging from red-pink, purple through a palette of reds more or less intense. The inclusions in rubies are in no way a show of poor quality. They are rather a guarantee of the authenticity of your stone while providing information on its history and origins. These inclusions are minerals that form under the same conditions as rubies. There was even a time when artists loved to offer very visible inclusions to their wives. In general, rubies are cut into round or oval shapes. But other sizes such as pear, princess or marquise can fit perfectly as well. The particularity of emerald is its very characteristic green color, This color results from several chemical elements that become encrusted in the crystal giving it its green tone, the rate of its elements varies, which gives color tones varying from dark green to light green. Depending on where they are formed and the rock in which they are grown, emeralds vary in intensity, color, brightness, hardness and size, ranging from light green to dark green. The vast majority of emeralds contain inclusions due to their history during their crystallization (water in the form of droplets or crystals of other minerals). All these inclusions are of course common even in high caliber jewelry. Beyond being a guarantee of authenticity, they participate in making each stone unique and can provide an additional field for contemplation. Sapphires are part of the Ruby family. It crystallizes in very specific geological conditions. Sapphires have a wide range of colors from dark blue, almost black to light blue. Their color depends on their place of origin and the conditions in which they were formed. Sapphires generally contain fewer inclusions than Rubies and Emeralds. Although in some cases we can observe some that are quite normal and a proof of authenticity of the stone. Most of the time, thesee have no effect on the brilliance or the color of the sapphire. They can indeed help a specialist to retrace the history of the stone. - Edenly provides with each of its jewels a certificate of authenticity indicating the weight and the quality of the diamonds of its pieces. - For certain cuts of particular stones (marquise cut for example), or very large stones, an IGI institute (International Gemological Institute) or HRD certificate can in certain cases be provided to you as double guarantee. These are so-called "closed" certificates in which the diamond is sealed in a transparent polyester box. But for this to be done, there has to be a written request to the laboratory. - Finally, Edenly only works with Kimberley Process diamond dealers who ensure that the diamonds come from legal sources and not from war or any financing of arm conflicts.